In 1942, Fuller Albright first introduced the term pseudohypoparathyroidism to describe patients who presented with PTH-resistant hypocalcemia and hyperphosphatemia along with an unusual constellation of developmental and skeletal defects, collectively termed Albright hereditary osteodystrophy (AHO). These features included short stature, rounded face, shortened fourth metacarpals and other bones of the hands and feet, obesity, dental hypoplasia, and soft-tissue calcifications/ossifications. In addition, administration of PTH failed to produce the expected phosphaturia or to stimulate renal production of cyclic adenosine monophosphate (cAMP). However, the AHO phenotype is not a feature of PHP-1b or PHP-2. 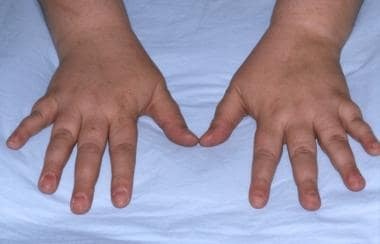 Patient with pseudohypoparathyroidism showing shortened fourth metacarpals. GNAS mutations on paternally inherited alleles (PPHP) have only the phenotypic features of AHO without hormonal resistance. Davies et al reported an analysis of pedigrees of families that included patients with PHP and PPHP, suggesting that patients who inherit the defective gene from the father have pseudo-PHP, because the mutant gene is not expressed and the product of a single maternally inherited GNAS1 gene preserves normal responses to PTH and thyrotropin. However, the occurrence of AHO in patients with pseudo-PHP indicates that one GNAS1 gene is not sufficient in all tissues. Testotoxicosis with PHP-1a can occur. Gonadotropin-independent sexual precocity has been reported in 2 boys who presented in infancy with classic PHP-1a. Usually, patients with PHP-1a show resistance to luteinizing hormone, which could lead to primary testicular insufficiency. The paradoxical presentation of testotoxicosis in these boys resulted from an identical point mutation in the GNAS1 gene, which caused both a loss and gain of Gsα function. PHP-1a, characterized by a loss of Gsα function, is caused by thermal inactivation of the mutant protein at body temperature. Testotoxicosis indicates an organ-specific gain of Gsα function, resulting from the expression of the mutant protein. The lower temperature of the testes protects the mutant protein from thermal inactivation. Several other peptide hormones, including thyroid-stimulating hormone (thyrotropin), antidiuretic hormone, gonadotropins, glucagons, adrenocorticotropin, and growth hormone–releasing hormone, use the α subunit of stimulatory G protein to enhance cAMP production. Patients with PHP-1a can present with resistance to the effects of any of these hormones, although in most patients, responses to corticotropin and glucagon are clinically unaffected. The dominant pattern of inheritance of PHP-1a has been attributed to haploinsufficiency of GNAS1, meaning that the protein produced by a single normal Gsα allele cannot support normal function, although it may suffice for survival. The single normal Gsα allele preserves the responses to hormones such as corticotropin and glucagon. The haploinsufficiency of the GNAS1 gene is tissue specific, which may explain the selective resistance to hormones and the characteristic habitus of patients with PHP-1a. Pseudopseudohypoparathyroidism (PPHP) is caused by GNAS mutations on paternally inherited alleles. Paternal inheritance accounts for differences in the same family where some patients with a defective GNAS1 gene inherited maternally have resistance to PTH (PHP-1a), whereas others with PPHP share with them the habitus of AHO but are not resistant to PTH. Mantovani G, Linglart A, Garin I, Silve C, Elli FM, de Nanclares GP. Clinical utility gene card for: pseudohypoparathyroidism. Eur J Hum Genet. 2013 Jun. 21 (6):[Medline]. [Full Text]. Levine MA. An update on the clinical and molecular characteristics of pseudohypoparathyroidism. Curr Opin Endocrinol Diabetes Obes. 2012 Dec. 19 (6):443-51. [Medline]. [Full Text]. Clarke BL, Brown EM, Collins MT, Jüppner H, Lakatos P, Levine MA, et al. Epidemiology and Diagnosis of Hypoparathyroidism. J Clin Endocrinol Metab. 2016 Jun. 101 (6):2284-99. [Medline]. [Full Text]. Underbjerg L, Sikjaer T, Mosekilde L, Rejnmark L. Pseudohypoparathyroidism - epidemiology, mortality and risk of complications. Clin Endocrinol (Oxf). 2015 Sep 21. [Medline]. Ritter C, Göbel CH, Liebig T, Kaminksy E, Fink GR, Lehmann HC. An epigenetic cause of seizures and brain calcification: pseudohypoparathyroidism. Lancet. 2015 May 2. 385 (9979):1802. [Medline]. Davies SJ, Hughes HE. Imprinting in Albright's hereditary osteodystrophy. J Med Genet. 1993 Feb. 30(2):101-3. [Medline]. Tafaj O, Jüppner H. Pseudohypoparathyroidism: one gene, several syndromes. J Endocrinol Invest. 2017 Apr. 40 (4):347-356. [Medline]. Sanchez J, Perera E, Jan de Beur S, et al. Madelung-like deformity in pseudohypoparathyroidism type 1b. J Clin Endocrinol Metab. 2011 Sep. 96(9):E1507-11. [Medline]. [Full Text]. Bliek J, Verde G, Callaway J, et al. Hypomethylation at multiple maternally methylated imprinted regions including PLAGL1 and GNAS loci in Beckwith-Wiedemann syndrome. Eur J Hum Genet. 2009 May. 17(5):611-9. [Medline]. Mantovani G. Pseudohypoparathyroidism. Orpha.net. Available at http://www.orpha.net/consor/cgi-bin/Disease_Search.php?lng=EN&data_id=12935&Disease_Disease_Search_diseaseGroup=Pseudohypoparathyroidism&Disease_Disease_Search_diseaseType=Pat&Disease(s)/group%20of%20diseases=Pseudohypoparathyroidism&title=Pseudohypoparat. October 2014; Accessed: August 29, 2017. Nakamura Y, Matsumoto T, Tamakoshi A, et al. Prevalence of idiopathic hypoparathyroidism and pseudohypoparathyroidism in Japan. J Epidemiol. 2000 Jan. 10(1):29-33. [Medline]. Long DN, McGuire S, Levine MA, et al. Body mass index differences in pseudohypoparathyroidism type 1a versus pseudopseudohypoparathyroidism may implicate paternal imprinting of Galpha(s) in the development of human obesity. J Clin Endocrinol Metab. 2007 Mar. 92(3):1073-9. [Medline]. [Full Text]. Shalitin S, Davidovits M, Lazar L, et al. Clinical heterogeneity of pseudohypoparathyroidism: from hyper- to hypocalcemia. Horm Res. 2008. 70(3):137-44. [Medline]. Balavoine AS, Ladsous M, Velayoudom FL, et al. Hypothyroidism in patients with pseudohypoparathyroidism type Ia: clinical evidence of resistance to TSH and TRH. Eur J Endocrinol. 2008 Oct. 159(4):431-7. [Medline]. Mantovani G, Bondioni S, Linglart A, Maghnie M, Cisternino M, Corbetta S. Genetic analysis and evaluation of resistance to thyrotropin and growth hormone-releasing hormone in pseudohypoparathyroidism type ib. J Clin Endocrinol Metab. 2007 Sep. 92(9):3738-42. [Medline]. Vlaeminck-Guillem V, D'herbomez M, Pigny P, Fayard A, Bauters C, Decoulx M, et al. Pseudohypoparathyroidism Ia and hypercalcitoninemia. J Clin Endocrinol Metab. 2001 Jul. 86 (7):3091-6. [Medline]. Landreth H, Malow BA, Shoemaker AH. Increased Prevalence of Sleep Apnea in Children with Pseudohypoparathyroidism Type 1a. Horm Res Paediatr. 2015. 84 (1):1-5. [Medline]. [Full Text]. Mahmud FH, Linglart A, Bastepe M, et al. Molecular diagnosis of pseudohypoparathyroidism type Ib in a family with presumed paroxysmal dyskinesia. Pediatrics. 2005 Feb. 115(2):e242-4. [Medline]. Freson K, Izzi B, Labarque V, et al. GNAS defects identified by stimulatory G protein alpha-subunit signalling studies in platelets. J Clin Endocrinol Metab. 2008 Dec. 93(12):4851-9. [Medline]. Todorova-Koteva K, Wood K, Imam S, Jaume JC. Screening for parathyroid hormone resistance in patients with nonphenotypically evident pseudohypoparathyroidism. Endocr Pract. 2012 Nov-Dec. 18(6):864-9. [Medline]. Weinhaeusel A, Thiele S, Hofner M, et al. PCR-based analysis of differentially methylated regions of GNAS enables convenient diagnostic testing of pseudohypoparathyroidism type Ib. Clin Chem. 2008 Sep. 54(9):1537-45. [Medline]. Neary NM, El-Maouche D, Hopkins R, Libutti SK, Moses AM, Weinstein LS. Development and treatment of tertiary hyperparathyroidism in patients with pseudohypoparathyroidism type 1B. J Clin Endocrinol Metab. 2012 Sep. 97(9):3025-30. [Medline]. [Full Text].